Is risk-taking only the province of the young? Do desperate times call for desperate measures? Or, more to the point, can the impossible be made possible? These are some of the questions that form the core of David Malouf’s most recent novel, Ransom. WARNING: Spoiler if you don’t know the Iliad! Ah, I thought, here is going to be Malouf’s vision (or recipe even) for our conflict ridden times. He wants to show, through Priam’s desire to do “something impossible. Something new” that there is another way of managing conflict. But sadly, that is not what he is about. Sure, Priam does do something audacious – he enters Achilles’ compound as an ordinary man on a plain mule-driven cart driven by an even more ordinary man, the humble carter, Somax. But, I was disappointed, because after a lovely interval of humanity the story plays out as it always does with Achilles dying, and Priam being brutally killed by Achilles’ son. What I hoped Malouf was setting me up for wasn’t his goal at all. It was something both bigger and smaller. Smaller because he is not (really) making a political statement for our times, and bigger because he re-visions the story as one of humans rather than of heroes, and as one in which humans can be self-directed rather than at the whim of the gods. There is some irony here though because, as well as being accompanied by the humble Somax, he is for a while escorted by the god Hermes who facilitates their entry into Achilles’ compound. I did wonder about the meaning of this unlikely trio – common man, king, god – but it is in the original and so is not really part of a new message. That said, this is, as I am sure you are starting to realise, quite a complex book despite its small size – and I am only going to touch the surface here. Some of the loveliest parts of the book are in fact the most human ones, such as the conversation Priam has with Hecuba when he reveals his idea, and Priam’s journey with Somax in which he learns to enjoy ordinary human (as against royal) pleasures. (“It had done him good, all that, body and spirit both”). So, what is it all about – besides, that is, the underlying themes relating to fathers and sons, grief, will versus fate, and humanity versus the gods? Perhaps it is simply this, that you can dare to try the impossible, and you can triumph. How big that triumph is, how long it lasts, is perhaps not the right question. The right question is the original one, “Dare I dream, and dare I do it?” It is also about the power of stories. Priam’s action will now be remembered “for as long as such stories are told”, while his killer, Achilles’ son, Neoptolemus, is not so lucky. The murder is a messy one and so “for him … however the story is told and elaborated, the raw shame of it will be with him now till his last breath”. In its rather ironic and paradoxical way, then, Ransom is redemptive … and is beautiful for all that. And yet, I do have this little nagging feeling that I’d have liked it to have been a little more. I did in fact want a recipe for our times, a suggestion that we can move our humanity forwards! I love books that are based on the ancient Greek myths – something eternal about them. In fact, I have just started reading Ransom. great combination David Malouf and Greek myth. Not sure it would be a good idea to change the actual events in the original story. Tony, my bookgroup and I discussed the ending and felt that changing the ending could make it “fairy-tale” and that that probably wouldn’t work. I’m not sure what I think he could have done – perhaps end it at a different point? But would that work? I was really rather relieved when one of my bookgroup friends brought a Guardian review by Tom Holland who clearly feels a little as I do. He suggests that Ransom “falls between two stools: neither true enough to Homer, not sufficiently untrue to him either”. I think this sums it up rather well. But, funnily enough, I still really like the book for what it does do and for how it is written. Nothing is laboured, it is all so light (ie not ponderous) but deeply human too. I’d recommend it to anyone (you still reading Stefanie?). I’m still reading 🙂 I’ll keep the book on my TBR list for sure now because if nothing else, I am really curious. I look forward to what you think when you’ve read it … will watch out for your review but I promise not to hold my breath! I do think I’ll have to read The Iliad first (and, whisperinggums, I think you needn’t worry about “spoilers”, as those who haven’t read the book have probably seen that horrible movie, Troy…), but I’m interested in this. 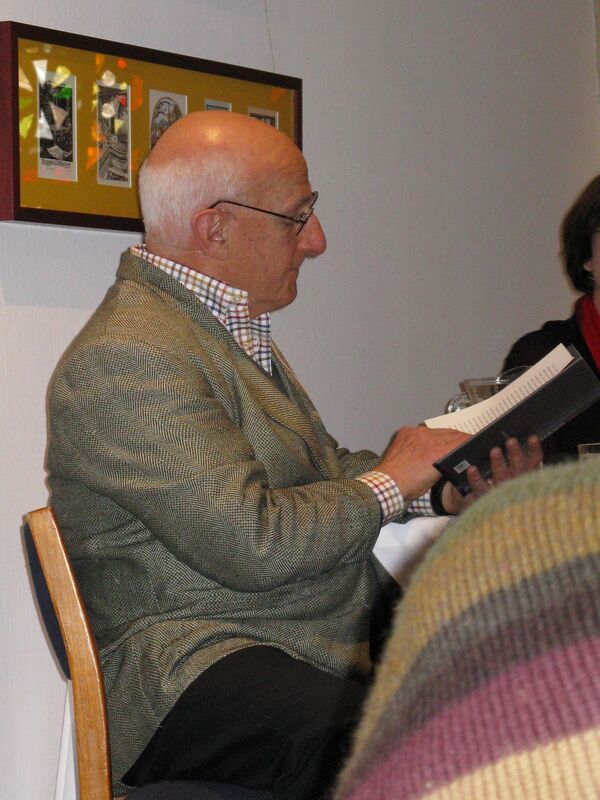 Also, David Malouf looks a bit like Grandpa. I want to hug him! Reading the Illiad, I’ve always sided with the Trojans and cried bitterly over Hector’s death, so I was very moved by Ransom. I liked its humanising of Priam and the dignity it gives to the common man Somax. I recently read an excellent New Yorker article about three re-tellings of Greek myths including Ransom which you might enjoy- it’s long, but worth the time. I was also interested by the biographical afterword where Malouf explained his first encounter with the story, especially as I’m about to read his autobiographical sketches 12 Edmondstone St. I love his use of his own background in stories like The Valley of Lagoons so am looking forward to it! Hannah, You really don’t have to read the Iliad first – though if you want to you could just read the relevant books. Sarah, thanks for the link. I have printed it and will read it. Malouf talked about his first encounter at the breakfast I went to, and in his interview with Ramona Koval on Radio National. He also talked about how there was no democracy during the Trojan War times so all the characters were nobles or warriors (or gods!!) and so he wanted to inject “ordinary people” into it. I really did like the book. It’s beautiful to read and I’m sure I’ll remember it, but like Tom Holland there’s still that little bit of me that says why?